The rock and roll of the 1950’s wasn’t the first example of African-American music and dance influencing mainstream culture. When young people scandalized their parents by dancing the Charleston and the Black Bottom in the 1920’s, they were borrowing both the moves and the music from Black people. The Black Bottom eventually became even more popular than the Charleston. It inspired Jelly Roll Morton’s “Black Bottom Stomp” and Ma Rainey’s “Ma Rainey’s Black Bottom,” which in turn inspired August Wilson’s play, Ma Rainey’s Black Bottom. Ma Rainey, whose given name was Gertrude, lived from 1886 to 1939. She was one of the first professional blues singers and one of the first to record her work. This pie has a crumb crust, analogous to the graham-cracker crust we used for the Mississippi Banana Cream Pie. But instead of graham crackers, it uses what the old-fashioned recipes call “chocolate wafers.” I made a diligent search for chocolate wafers, but they seem to have been crowded off modern supermarket shelves by much more elaborate and caloric cookies. A moist chocolate cookie won’t work for this recipe, as I discovered by trying to substitute Chocolate Chocolate Chip cookies for chocolate wafers. The cookie has to be as dry as a graham cracker, but chocolate. When I discovered that Oreo makes a ready-made chocolate-crumb crust that sits right next to the ready-made graham-cracker crusts in the cake-mix aisle, I realized that if I was determined to make a chocolate-crumb crust from scratch, I should just start with Oreos. So that’s what I did. But even so, it’s very hard to produce a crust that holds up well when the pie is sliced, so unless you are a determined purist, I recommend the ready-made crust. If you want to make your own . . .
30 whole Oreos, opened up and with the frosting removed. Use your food processor to reduce the Oreo halves, of which you will have 60, to fine crumbs. Mix the crumbs, butter, and sugar in a small bowl. Turn the result out into a pie pan and use a spoon to press it firmly to the bottom and sides, holding your thumb along the top to create a nice edge as you work on the sides. It’s important to press down very firmly with the spoon if you want your pie to cut into tidy slices. Bake the crust at 350 degrees for 10 minutes and let it cool while you prepare the filling. Put the milk in a saucepan, add the gelatin, and let it sit for a few minutes. Add the sugar, salt, and yolks and blend thoroughly. I used a wire whisk. Cook the mixture over medium heat, stirring with a spoon, until it gets thick (about like a thick cream soup), but don’t let it boil. It is now custard. Divide the custard between two bowls, one large enough to later accommodate three beaten egg whites too. Melt 1 1/2 oz. of the chocolate and add it to the custard in the smaller bowl, along with the vanilla. Mix well. Add the rum to the custard in the larger bowl. Mix well. Chill both bowls 45 minutes to an hour. The custard should now form a small mound if you scoop up a spoonful and deposit it back in the bowl it came from. Beat the egg whites until they are stiff and fold them into the custard in the larger bowl. Note that these egg whites will be essentially raw in your finished pie. This is an old-fashioned recipe and back then people worried less about raw egg whites than they do now. 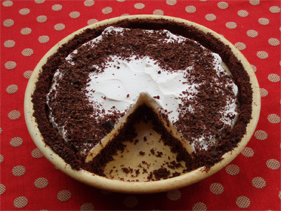 Turn the chocolate custard into the pie pan containing the crumb crust and smooth it out nicely. Add the custard-egg white mixture and smooth it over the chocolate layer. Whip the cream and smooth it over the top of the whole thing. Chop or grate the remaining 1/2 oz. of chocolate and sprinkle it attractively on top of your pie. Refrigerate the pie until you are ready to eat it, at least an hour, and be sure to store the leftovers in the refrigerator.